Memorial Day	Closed -	Remember those who sacrificed everything, the debt cannot be repaid. Independence Day	Closed -	Celebrate the founding of our great nation! Veterans Day	Closed -	Thank those who serve and have served our country. Thanksgiving Day	Closed -	Count your blessings and spend time with family & friends. Christmas Day	Closed -	Celebrate the Reason for the Season, Jesus Christ! 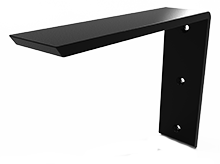 Our Countertop Support Brackets are simple to install. Our " standard countertop support bracket", "forward l countertop support bracket" and "side mount countertop support brackets" require a 2.5 inch wide by 1/2 inch deep channel is routed our chiseled out of the knee wall. The bracket is then mounted into the channel with #12 wood screws that are provided with your purchase. As the countertop support brackets are being mounted they should be checked to ensure they are level with the knee wall and shimmed to level if necessary. Builders glue (liquid nail) can be be applied to the mounting surface if desired to bond the countertop support to the granite. Will my installer understand how to mount the countertop support brackets? Most installers are familiar with our products. If not just print this page and hand it to them. Our countertop support brackets are easier to install than corbels and the installer will understand the instruction immediately. The first method requires the following tools. A saw, wood chisel and level. Measure and mark the appropriate mounting locations on the cap of your knee wall. Start at 6 inches in from the edges and space the brackets 18 - 24 inches apart. Using a T-Square mark two diagonal lines that are 2 and 9/16th inches apart from each other at each mounting location. Using a hand saw, cut along each line to a depth of 1/2 inch. Using a wood chisel (1 inch is a good choice), remove the material between the lines you just cut creating a clean and level mounting channel. Be sure to remove all of the material in the mounting channel. 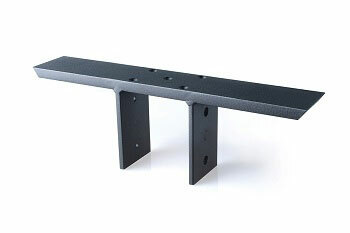 Place the bracket into the mounting channel and affix the bracket to the knee wall using the included screws. Use ALL of the screws included. You can also cover the bottom of the mounting channel with Liquid Nail for extra strength if deemed necessary. Using a level ensure that the bracket is level with the knee wall. If necessary shim the bracket level. The second method requires the following tools. A router, 1/2 inch "Top Bearing Flush Trim" router bit and level. Measure and mark the appropriate mounting locations on the cap of your knee wall. Using a T-Square mark a diagonal line at each mounting location. Use a 1/4 x 4 inch strip of wood as a router guide. Working left to right, align the inner edge of the router guide with the horizontal line you just marked and fasten the routing guide at that point. Using a Top Bearing Flush Trim router bit with a 1/2 inch deep cutting length, trim the excess wood out of the mounting surface. This should leave you with a clean, level channel for the bracket to be seated in. Be sure to remove any excess wood chips or saw dust from the mounting channel. Place the bracket into the mounting channel and affix the bracket to the cap using the included screws. Use ALL of the screws included. You can also cover the bottom of the mounting channel with Liquid Nail for extra strength if deemed necessary. Brackets that have side or back angles attached to them do not need a mounting channel to rest in as they are typically covered with sheet rock of some other surface material. Though you could create mounting channels for the additional mounting points it is much simpler to flush mount by trimming the sheet rock in that area and then apply a sheet rock patch. Be sure your knee wall or other object that you intend to use as a base for your granite countertop is well built and stable. If you're unsure consult a professional. We recommend pre-drilling all screw holes to prevent cracking studs. Though we off-set the screw hole positions to help avoid splits, pre-drilling is a good idea. Consider using Liquid Nail – it may seem like overkill considering the combined strength of the lumber and our half inch steel countertop support brackets. However the more surface area that is physically attached the stronger and more stable the joint will be for supporting granite countertops. Liquid Nail is an inexpensive extra touch for that extra measure of durability. Premier global manufacturer of steel countertop supports awards prize monies and charitable donations totaling $21,000 in inaugural year of program. ST. AUGUSTINE, FLA., DEC. 10, 2018—Centerline Brackets, a division of Centerline Steel, LLC, proudly announces winners of its 2018 Photo Contest and the awarding of $11,000 in total prize monies to top scorers in multiple categories. John Mitchell of Metairie, La. , was named Grand Prize winner after his entry depicting the complete remodeling of a home kitchen with a contemporary design and clean lines was judged best overall. For his win, Mitchell, who entered the Front-Mounting/Front-Mounting PLUS Support Bracket category, received $5,000. · Center-Levered Bar-Support Bracket: Jim Englund, Orlando, Fla.
· Floating Wall-Mount Bracket: Kelly Buczniewicz, Hazel Park, Mich.
· Front-Mounting/Front-Mounting PLUS Support Bracket : Frank Barrera, South Pasadena, Calif.
· Island Support/Island Support System Bracket : Danelle Dapp, Fort Wayne, Ind. · Spanning Support Bracket: Michael McCall, Binghamton, N.Y.
· Standard/Standard PLUS/Forward L Granite Support Bracket : Kurt Maynard, Palmetto, Fla.
Mitchell, who for the past 11 years has served as events catering manager for Audubon Nature Institute in New Orleans, praised the customer service he received from Centerline when ordering his brackets by phone. Contest entries were evaluated by outside professionals in interior design, marketing and photography. Criteria for entry included submitting a minimum of three digital images depicting action of installing Centerline support brackets, the installed brackets alone, and the completed project—which in most cases did not show the brackets due to their being inconspicuous or “hidden” from casual view. The contest was open to all Centerline customers around the world. “This was our first photo contest and, not knowing what to expect, we were quite pleased with the turnout,” says Tracy Smith, founding co-owner and CEO of Centerline Brackets, a majority-woman-owned company in the nation’s oldest city that produces steel brackets known industrywide for their quality, strength and affordability by builders, installers, homeowners and design centers globally. “Excitement erupted in the office each time a new entry arrived, and we’d all check it out. Mostly, it was thrilling to see the different projects and ways our brackets provide solutions to customers.” Adds Smith, plans are already under way to hold a second photo contest in 2019. In addition to prize monies, Centerline committed to donating $10,000 to the Grand Prize winner’s choice from a list of several well-known philanthropic organizations in the United States. Discussing the opportunity with Mitchell led Centerline to donate $5,000 to St. Jude’s Children’s Research Hospital in Memphis, Tenn., and $5,000 to the Jacksonville, Fla.-based Wounded Warrior Project. The inaugural photo contest caps Centerline’s sixth-anniversary celebration in 2018. To view winning entries, visit www.CountertopBracket.com. Founded in 2012, Centerline Brackets, a division of Centerline Steel, LLC, is a family-owned, “Golden Rule” company dedicated to uncompromising product quality coupled with superior customer service. All brackets are made from American steel and manufactured in Centerline’s state-of-the-art facilities in St. Augustine, Fla. In addition to its portfolio of countertop supports meeting the greatest number of conventional needs, Centerline’s full-service shop manufactures custom products to match any customer specifications. For more information, visit www.CountertopBracket.com and find us on Facebook and Instagram.